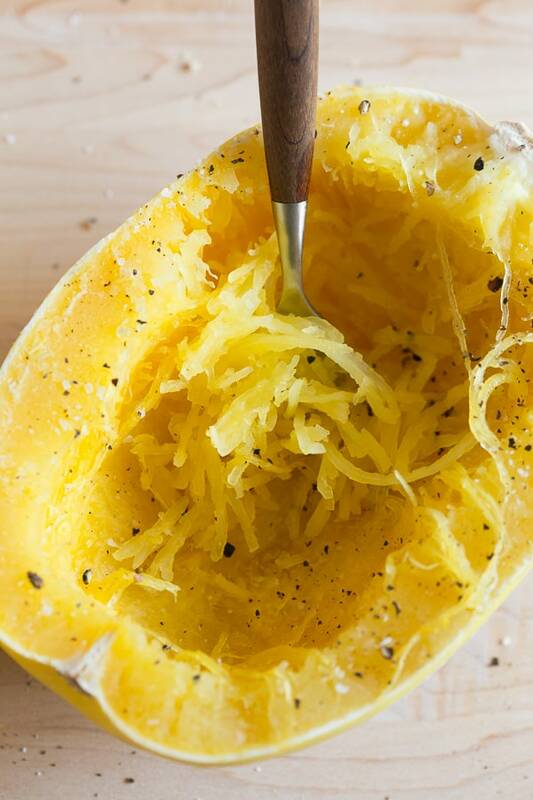 How to Cook Spaghetti Squash in the Microwave - ready in 20 minutes! 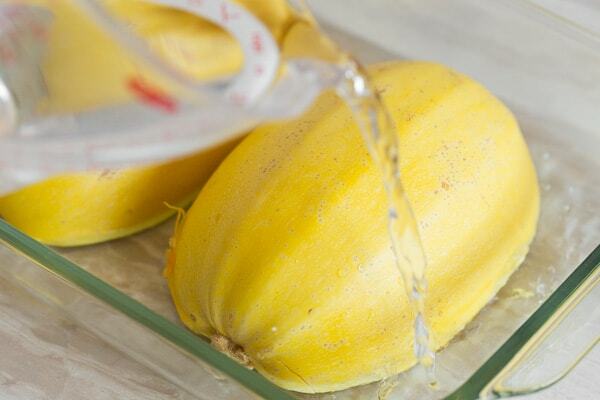 Have you ever wondered how to cook spaghetti squash in the microwave? I’m going to show you just how easy it is to cook spaghetti squash. Plus I’m going to give you a few delicious recipes to use with your perfectly cooked spaghetti squash. You know I LOVE spaghetti squash – right? I’ve made a few recipes on the blog over the years and you all seem to really dig them! Like my Southwest Taco Stuffed Spaghetti Squash and my Sausage and Peppers Stuffed Spaghetti Squash. I mean, what’s not to love about a winter squash that literally shreds like pasta? Now, usually I roast my squash BUT I’m here to share a secret with you today. That means cooking spaghetti squash just got even easier! I used a lot of exclamation points up there. Sorry, I’m basically Elaine Benes. That’s it! How freaking simple is that?! 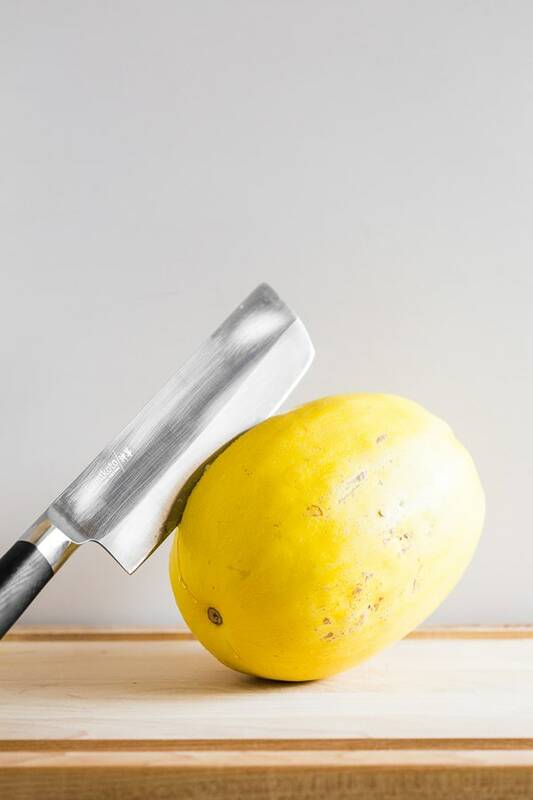 I often get asked how to make spaghetti squash so this post has been a long time coming. Obviously, the first you want to do is cut that spaghetti squash half. I’m honestly always relieved when I manage to cut through squash and not chop my hand off. I seriously wonder the statistics are on people losing fingers because they were just trying got cut a squash in half? If you’re really scared of cutting into the squash you can stab it all over with a fork (making little vent holes) and put it in the microwave for about 4 minutes. This will help soften the outer skin and make it easier to cut through the squash. 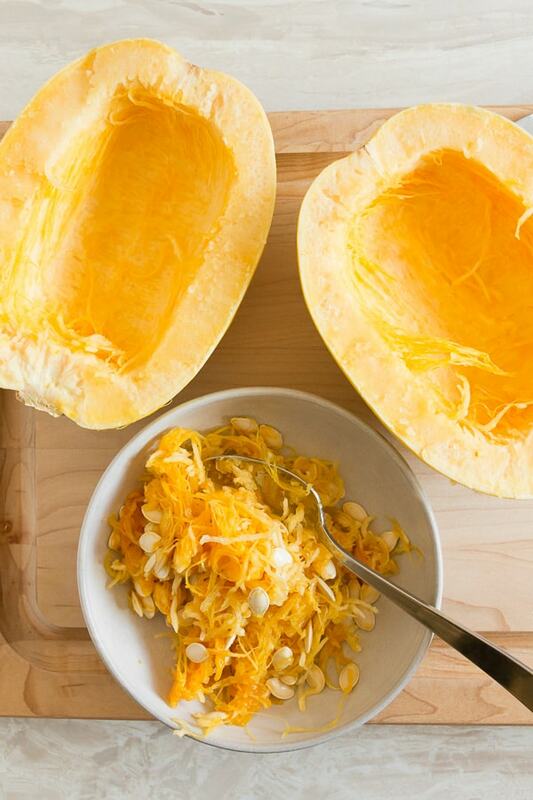 After your squash is cut in half it’s time to scoop out all those seeds and weird stringy insides. I’m betting you could roast those seeds and make a pretty killer snack. A few years ago I made sweet salty roasted pumpkin seeds and now I have a craving to try this with my spaghetti squash seeds. I love being able to use all the squash. After your spaghetti squash is cut in half you put it cut side down into a 9×13 glass pyrex dish. My microwave is wide enough to fit a dish this size but if you own a smaller microwave you can easily do each half separately in an 8×8 or save the other half for later in the week. I love the idea of saving half for later in the week because I can almost never finish a whole squash. It’s so good but I’m not that much of a beast. How long to cook spaghetti squash? One of the most important steps to making this whole “how to cook spaghetti squash in the microwave” recipe actually work is adding the water. You’re looking for about 1-inch of water in the dish before it goes into the microwave. This helps steam the squash so it turns out soft and delicious. My microwave takes about 15 minutes to fully cook but that timing should be adjusted for the size of your squash and the wattage of your microwave. Also, make sure you don’t run out of water in your pan. 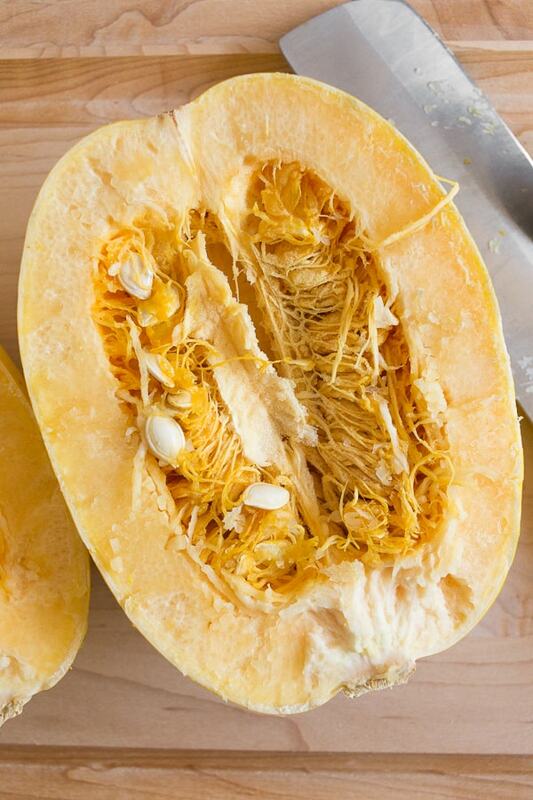 After your squash is ready you just use a fork to shred the inside flesh. I pull it in from the sides and bottom and it should all come off from the outside shell. It’s sorta amazing to see it all pull off and just throw away a thin squash shell. That’s it. That is how you cook a spaghetti squash in the oven. And shredding is all you have to do to “make” the squash. 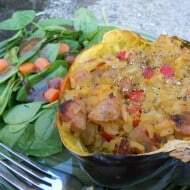 Love this How to Make Spaghetti Squash in the Microwave post? 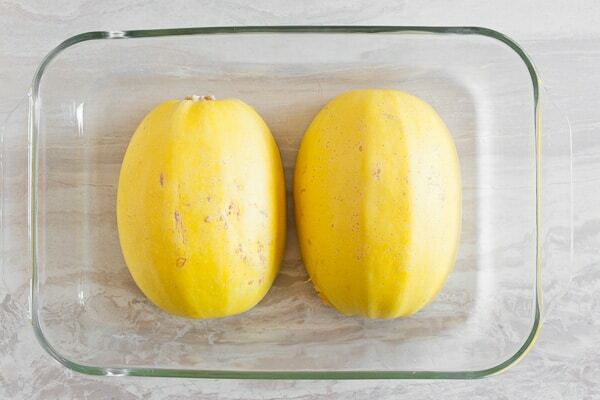 Have you ever wondered how to cook spaghetti squash in the microwave? I'm going to show you just how easy it is to cook spaghetti squash. 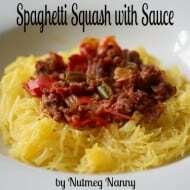 Plus I'm going to give you a few delicious recipes to use with your perfectly cooked spaghetti squash. Scoop out the seeds and stringy insides of the squash. 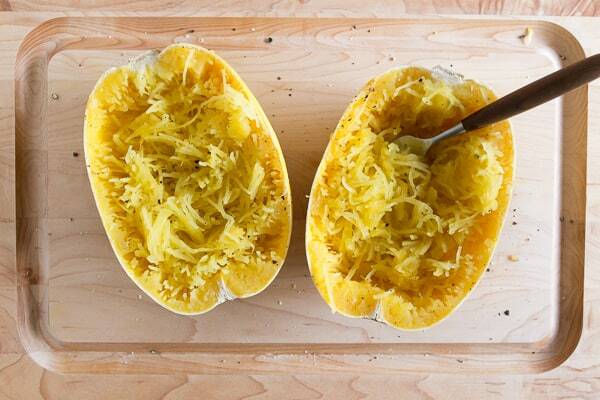 Lay the spaghetti squash, cut side down, into a 9x13 microwave safe glass pan. Pour the water into the dish. You want about an inch of water in the dish so add more if needed. Add squash to the microwave and cook for anywhere from 10-15 minutes depending on the size of the squash and the wattage of the microwave. The squash is ready when it can be easily pierced with a fork and the inside flesh of the squash shreds like noodles. 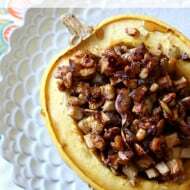 Carefully remove from the pan, shred the inside of the squash with a fork and season with desired amount of kosher salt and black pepper. Always be careful cutting squash in half as it's an easy way to lose a finger. I like to cook my squash for 10 minutes and then test to see the doneness. In my 950watt microwave it takes 15 minutes for a 4 pound squash. 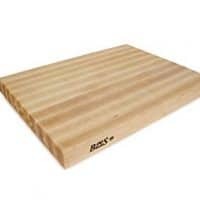 If you microwave cannot hold a 9x13 pan you can cook them separately in an 8x8 pan or save a raw half for the next day. I don’t even do the cutting in half step. I just make cuts all around the spaghetti squash with a knife, then place in microwave on medium-high in 15 minute. It’s shoulb be rotated spaghetti squash every 5 minutes until soft. After remove from microwave, let it cool a bit then cut it in halfs and scoop out the seeds. Finally, scrape out the spaghetti-like strands with a fork and serve with cheese kosher salt and black pepper. It’s so good! So many ways to make spaghetti squash and I love these directions on how to cook in the microwave! 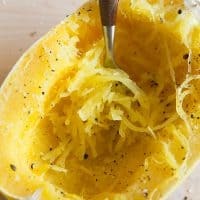 My favorite way to cook spaghetti squash! So easy! Thanks for all the great tips!! I love Spaghetti and will be trying some of the different post here. I’ve never tried to cook it in the microwave, but it sounds like a yummy and easy way! I love spaghetti squash! I have to try your method! I have spaghetti squash that I need to use! Trying this method soon! Awesome share.!!!!!!!! .Your article will help me. Thanks for sharing this amazing post.